Bangladesh is often touted as a development star. The nation has famously slashed maternal deaths by 40 percent in the last decade, pioneered micro-finance and increased women’s participation in the country’s economy. But for millions of women in this small country nestled under the eastern wing of India, simply being able to access information about their health and medical rights remains an out-of-reach luxury despite skyrocketing mobile subscribers and Internet usage nationwide. One organization is setting out to change this reality. 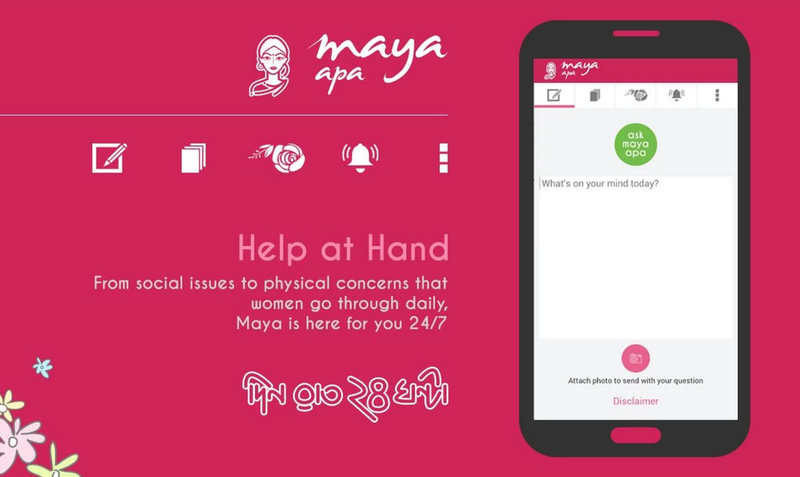 Maya is Bangladesh’s first website and corresponding mobile application geared toward women and a broad range of women’s health issues. Siddiqui points out that women, irrespective of education and financial means, do not feel comfortable talking about their physical and emotional problems — even with their doctors. Users can choose their language of preference from Bangla or English, and a team of doctors, lawyers and psychosocial counselors will respond to a query within 48 hours. The company’s online success led it to partner with the iconic Bangladeshi development organization, BRAC, for the recently launched, “Maya Apa,” the country’s first one-touch help mobile app for women. Breaking stereotypes and taboos is a mission the women behind Maya take very seriously, and the mobile app itself was designed, developed, and implemented by a team of Bangladeshi female engineers, doctors and entrepreneurs, putting stereotypes of women being unfit to thrive in the tech sector to shame in this majority Muslim country. “Since launching the first iteration of Maya nearly five years ago, we have learned a lot about the knowledge that women seek out and how they go about finding it,” said the founder, Ivy Huq Russell, who named the website and app after her mother. Successfully launching the website and now its corresponding mobile app is no small feat anywhere let alone in a country like Bangladesh. The technology is revolutionary not only for being the first service of its kind in the country, but for carving out space for women in the country’s booming, yet still largely male-dominated start-up scene. A quick glance over the app’s user reviews provides insight not only into how helpful the technology has been for women, but for men as well. A large number of the responses praise the app’s user-friendly interface and the information it provides newly-married men and women. Although some who posted on the site criticized the length of time it takes to get responses, one female user said she asked over 15 questions in a single day, and was impressed to receive all queries answered in 48 hours. While building technology to empower women, the women behind Maya have opened the doors for countless other women in the country to enter the science and technology sector, a challenge that remains large even in America. Despite the positive progress, Russell says there is a lot of room for improvement to support women who work in Bangladesh’s tech sector. She points to security as a key concern, especially for her female staff members traveling alone late at night after work. Breaking into an all-male office culture also remains a cultural struggle for the staff at Maya. However, Russell says she is not complaining and that moving forward, ultimately it is the parents in Bangladesh who hold the power to change the status-quo. With the “Maya Apa” mobile app and website, empowerment in Bangladesh is now not only downloadable, but something that women and girls can literally carry with them. *This post of mine was also published on Women in the World/ The New York Times.